Thanksgiving is quickly approaching as I see people in grocery stores heaving big turkeys into their carts. For some families a turkey may be too big or to time consuming, especially if you have a busy weekend planned. Roasted chicken is a quicker alternative to a full size turkey as it cooks quicker and there are less leftovers. This is a recipe for a honey roasted version made with buckwheat honey. This honey has a very distinct flavor that is great in cooking. You can use plain honey if that is all you have on hand. 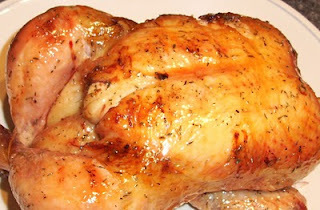 You can grill this chicken on the barbecue or roast it in the oven. 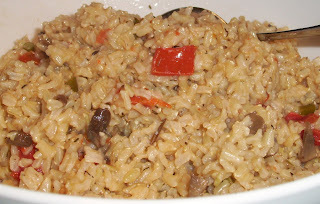 The second recipe is for a pilaf that features garlic scapes. I discovered these at the farmers market this summer. They look like long curled green onions and have a very strong garlic flavor. Again if you can't find them just use garlic cloves instead. I would just like to thank my readers for supporting my blog and thank the websites that seek my blog out and feature me on their website. It really means a lot to me! Rinse and pat dry chicken. Place in roasting pan and place in oven or on grill(on opposite side burner is lit). Meanwhile combine the rest of ingredients in a bowl. In a pot heat the oil and saute the garlic, thyme, mushrooms and tomatoes. Add the rice and toss to coat well. Pour in the broth stir to mix. Bring to a boil reduce heat and cover. Simmer for 45 minutes until water is absorbed and rice is tender.